Tag Archive | "13″ doll bunting"
This doll bunting pattern was adapted and printed with permission from Sue Thomson who designed a baby bunting for a newborn. Her free crochet pattern can be found here. 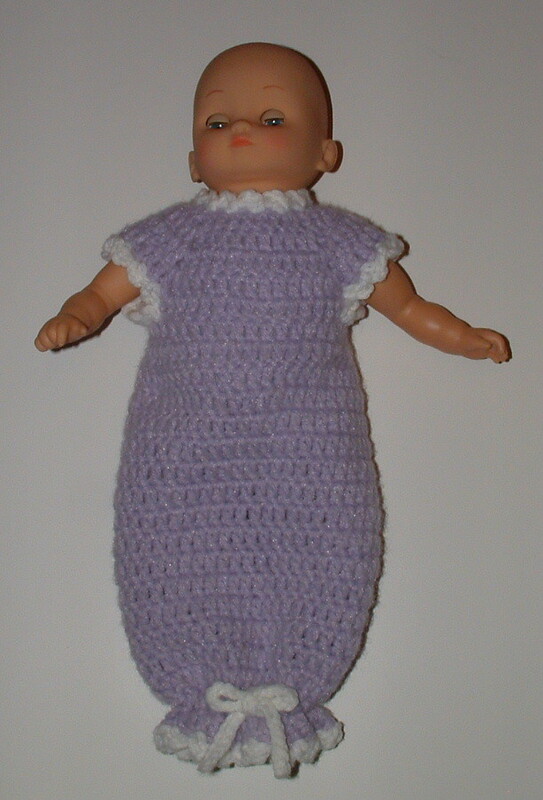 After re-working the pattern several times, I finally got the right fit for a baby doll that is about 13 inches tall. I crocheted the doll bunting and added a stocking cap to finish off the outfit. The hat is more of a sleeping cap for this outfit but the crochet pattern can be used for any doll that has a 10-1/2″ head circumference. Enjoy the free doll bunting pattern below and happy crafting to all!